There is no doubt that the newly elected government will favour deregulating the price of diesel as well as other petroleum products in lieu of subsidies or grants to the oil sector. 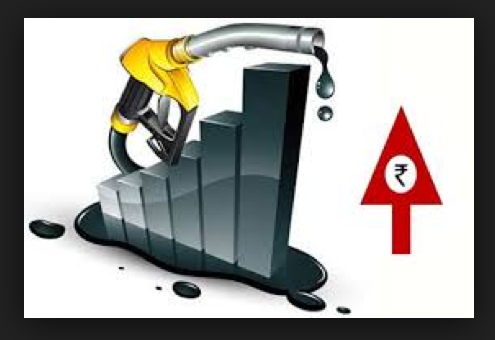 At least on this issue both governments (NDA as well as UPA) are of the same view, despite the fact that under-recovery on diesel touched record low at Rs 2.80 per litre on 2nd of June ’14 .(www.pib.nic.in). Since January 2013, Oil Marketing Companies (OMCs) were allowed to increase the price of diesel by 40-50 paisa per month on until under-recovery on diesel vanishes completely. It is postulated that in coming few months the diesel price will be left open to free market if the same pricing trend continues and other macro indicators do not change. This article focuses on two aspects- first; the validity of arguments which favour price deregulation of petroleum products and the second; the possible gains and losses of such an outcome. Deregulation is promulgated in response to huge losses made by OMCs or “under –recovery” faced by the oil-sector and as a result of these the government is facing added fiscal burden. – How far this is true? “Under-recovery” is not congruent to loss (Sethi, 2010, and Dasguta & Chatterjee, 2012). It is the gap between desired price and administered price. Apart from the actual cost, desired price includes many other elements like cost & freight charges, import and custom duties etc. which just inflate desired price and, in turn, produce “under-recovery”. These factors amount to overestimating the actual loss, given the fact that India doesn’t import petroleum products but only crude-oil. In fact India’s refining capacity of crude oil is more than its domestic demand and is exported. Because of this over-estimation, under-recovery is cited as ‘loss’. Reported under-recovery is far greater than the actual loss. Apart from 2008-09 and 2011-12, the average gap between under-recovery and loss has been around Rs 17000 crore. As far as questions of financing under-recovery are concerned, almost 50% of it is absorbed within the sector and remaining 50% is financed by government. Another interesting point worth noting is regarding, how the “loss” is understood. For this we need to understand the structure of the oil-sector. There are 14 Public Sector Under-takings (PSUs) under the Ministry of Petroleum and Natural Gas. Out of these, six of them are involved in major businesses. On the basis of their financial performance, these 6 companies are further classified as up-stream and down-stream companies. ONGC, GAIL and OIL are up-stream companies. Their prime businesses involves extraction and purchase of crude oil (ONGC also undertakes refining but its share in the total is very small). IOCL, BPCL and HPCL are down-stream companies involved mainly in refining and retailing (IOCL also purchases crude but its share is very small). The down-stream companies are the loss making bodies in the oil-sector. But there are no documentary estimates of actual loss. So by looking at the profit and loss accounts of these three retail units and by taking into consideration the external elements we can arrive at a figure of loss which is different from the claimed under-recovery. There are three external elements in the profit & loss account - grants by government, subsidy as per scheme, and discount by up-stream companies. Grants are given to down-stream companies against their claim of under-recovery. 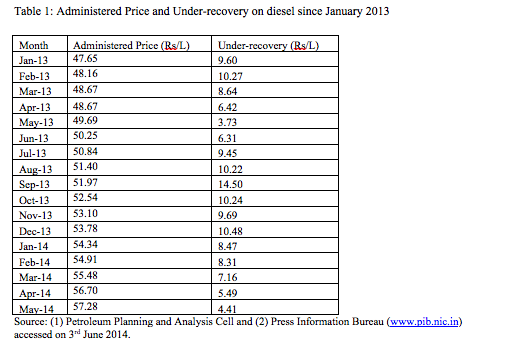 Since June 2010, there has been no under-recovery on petrol. In the case of diesel, partial deregulation is allowed (as mentioned above) since January. Only two petroleum products i.e. PDS kerosene and LPG have not yet witnessed any deregulation in their prices till now (but there is a limitation on number of subsidised LPG supplied to households). Subsidy as per scheme is also given to down-stream companies only for these two products. Other than the government a part of under-recovery is also financed by up-stream companies in terms of discounts on crude-oil prices. Now it is true that if we remove all these three external elements of financing under-recovery then the profit of down-stream companies turns out to be negative i.e. IOCL, BPCL and HPCL are making losses. Here three important points need to be noted. 1. Product-wise disaggregation of cost of production is impossible since the refining process is very complicated. Actually different products are recovered at different levels of the same production process. So any claim of product specific loss has always some degree of imperfection. 2. Since product specific loss calculation is almost impossible, we have to look at aggregate loss. For this purpose we need to look at the whole production process. IOCL, BPCL and HPCL primarily refine crude oil and sell it to retailers. Here we need to be cautious as production process of petroleum products doesn’t start from refining but from extraction of crude. So any calculation of aggregate loss must include the whole production process. India imports around 80% of its crude oil demand and the rest is extracted domestically. So in the Indian case 80% of the production process starts from importing crude oil and the rest 20% from extraction. For the purpose of arriving at a figure of aggregate loss we have to include all companies of the oil-sector. After adding these, loss vanishes and we find that in fact the oil- sector as a whole earns profits, even with the present structure of taxes and duties, for most of the time, in last seven years. Even if we consider the loss of OMCs, there should still be some analysis of the government’s claim of fiscal burden. Here we should note that Tax+Duties earned by the government (central as well as state, although states’ share is very small) from the Oil-Sector is far greater than the under-recoveries and subsidies (Sethi, 2010) and through the same way government earns huge revenue from OMCs as well. So the claim that the government is facing a huge fiscal burden is wrong. Almost half of the under-recovery is financed by government of India so it is possible that post deregulation, government exchequer will save some money. The remaining half of the burden is shared by up-stream companies so these companies will also get rid of this “so called” burden and finally some part of the burden is absorbed by OMCs, henceforth after complete removal of under recovery these companies need not to do so. Apart from these, OMCs will also get rid of cash flow problem, which is caused by delay in payment by government. But the above benefit can’t be said significant as part of under recovery shared by up-stream companies is very small in comparison to its profit and that’s why for most of the year even after absorbing this cost, sector as a whole makes profit. A similar argument could be constructed for government as amount incurred for financing under recovery is very small in comparison of what government gets from the sector or OMCs in form of taxes, duties and royalties. Then the questions arise, if government or oil-sector is not going to be benefited appreciably then who are going to be possible beneficiary from this move and on what cost? Apart from the PSUs there are some private players engaged in retail business. Essar and Reliance are two big names in this area. Currently Essar has 1400 operational retail outlets and also ready to add 1600 more (Business Standard Oct. 2013). Reliance has currently 1450 retail outlets out of which 280 are operational at present. Given their potential they can enter and expand their retail business after complete removal of under-recovery. These private companies have also huge refining capacity. Essar and Reliance account for 80 Million Metric Tonne Per Annum (MMTPA) out of 215.07 MMTPA of all India including PSUs and joint venture i.e. around 37% (Refinery Map of India, PPAC). Currently Reliance and Essar are primarily exporting petroleum products but after price deregulation selling in the domestic market would be easier. This policy move will help private players to capture a significant portion of market which is currently in PSUs hands on one hand and on the flip side this will influence common man’s budget, with inflation on course (Patnaik, 2011). The stake of balance between powers is such that the newly elected government would definitely ensure the interest lies with the former. Manish Kumar (manish14jnu@gmail.com) & Surobhi Mukherjee (007surobhi@gmail.com) are M. Phil research scholars at Centre for Economic Studies and Planning, Jawaharlal Nehru University.